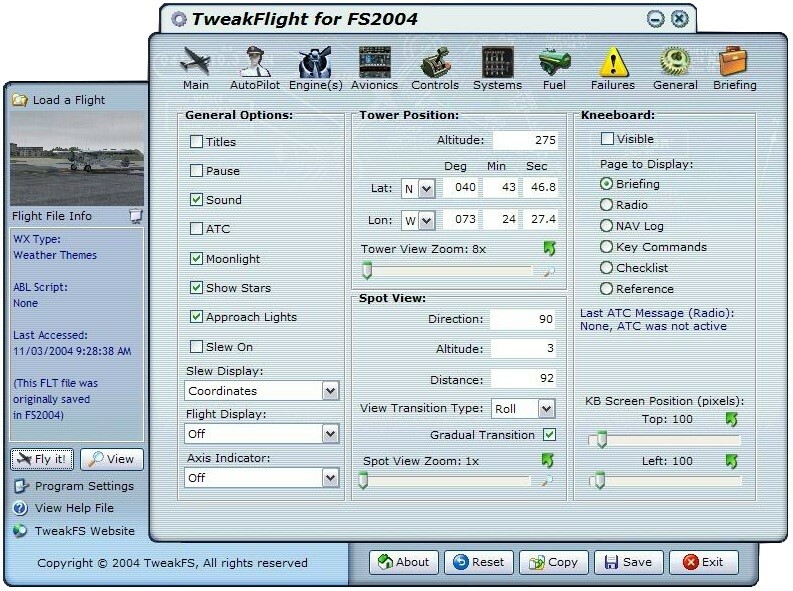 Edit and launch your saved FS2004 Flight (FLT) files. 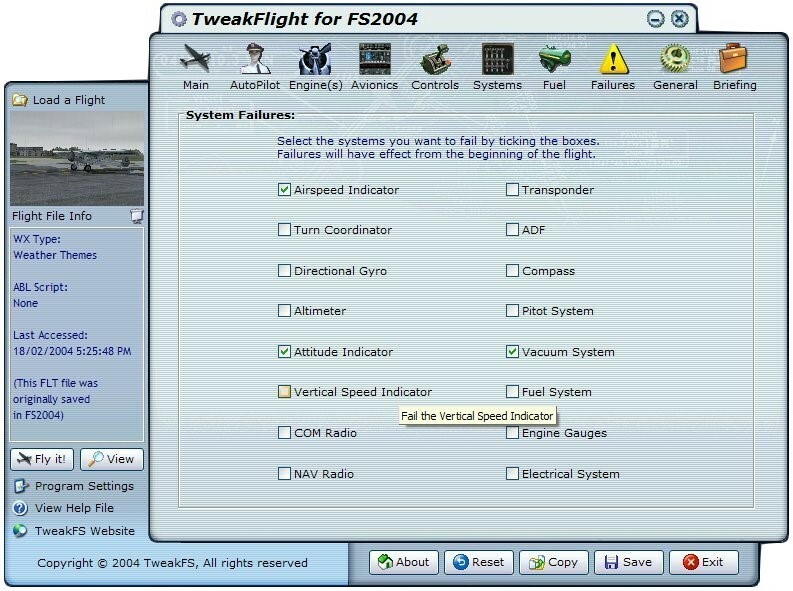 Each Flight you save has a wealth of information but all those recorded parameters are basically "set in concrete" once you save the flight, any adjusting of the variables cannot be done from within FS2004. 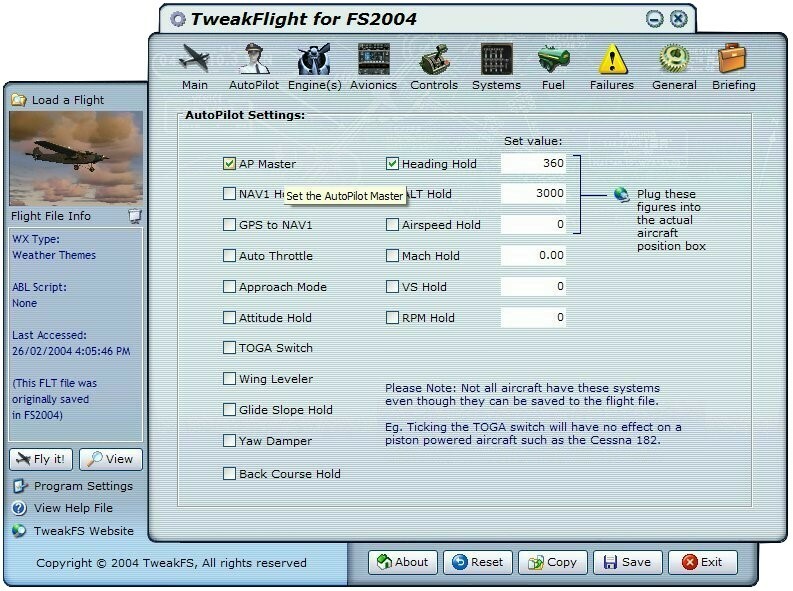 With TweakFlight you can change over 150 settings which are presented in a quick and easy to understand format. 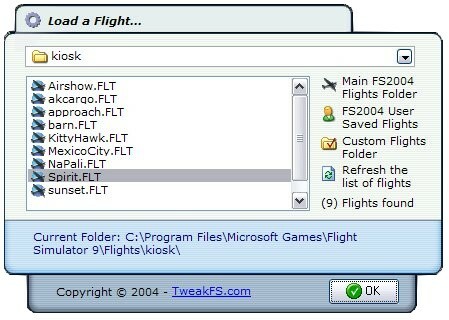 Taking screenshots and assigning them to a flight is a snap with our integrated screenshot utility. 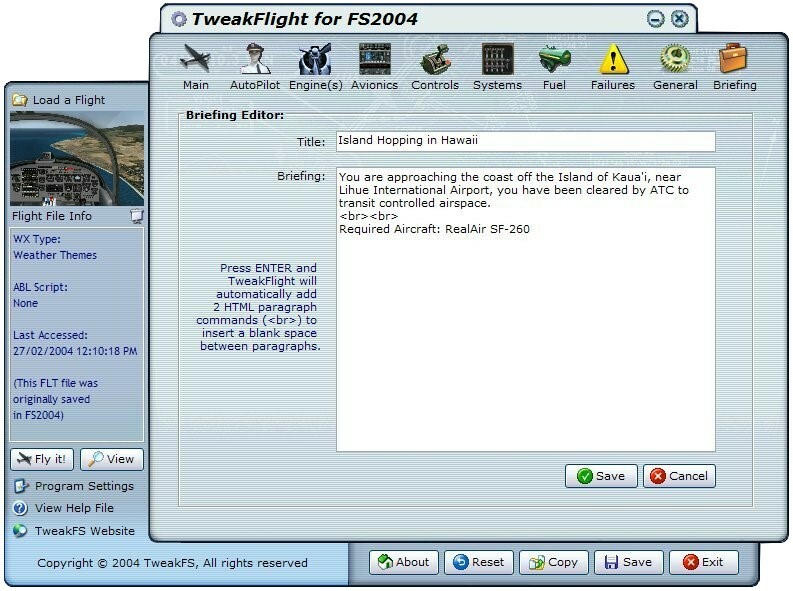 The screenshot will be displayed in the top left-hand corner of TweakFlight which helps identification of a flight. Clicking on thumbnail will expand it to full size. 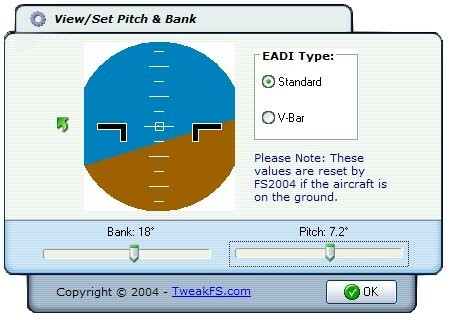 Various sizes and and image quality setting are included as options. 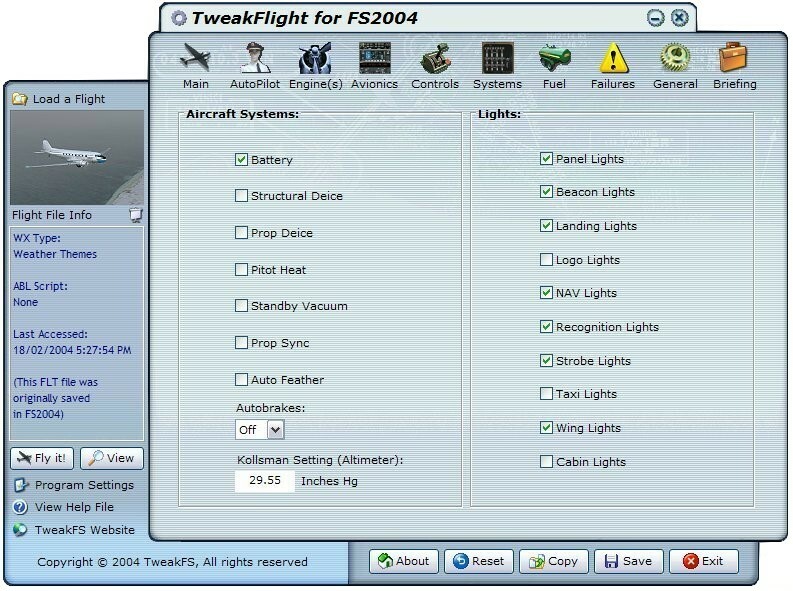 Generally speaking utilities can be rather plain-looking. 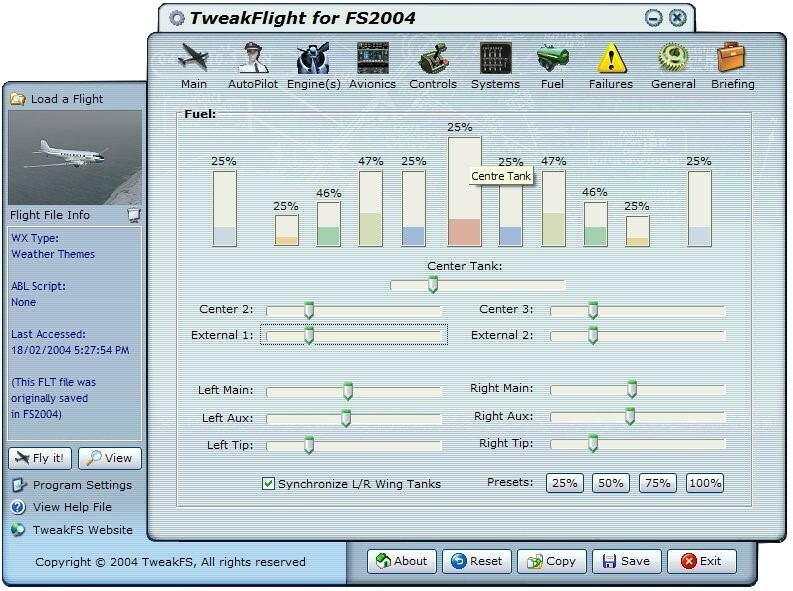 We have also put much thought and effort into making TweakFlight pleasing to the eye. 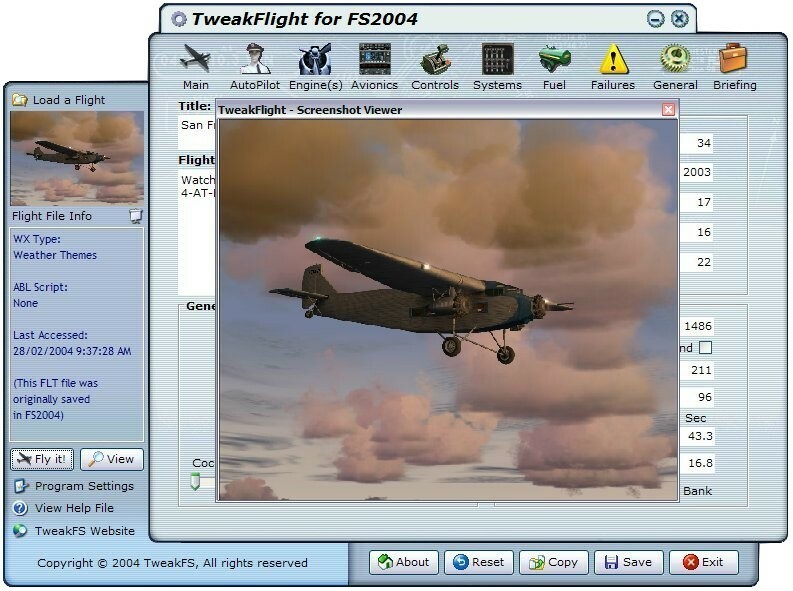 We recommend running TweakFlight under Windows Vista or later for the best visual experience. 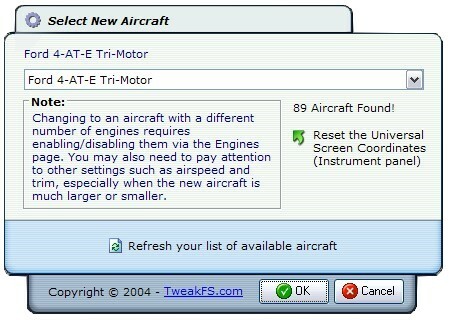 Windows 98/ME does not produce the same results with some of the special transparency features. 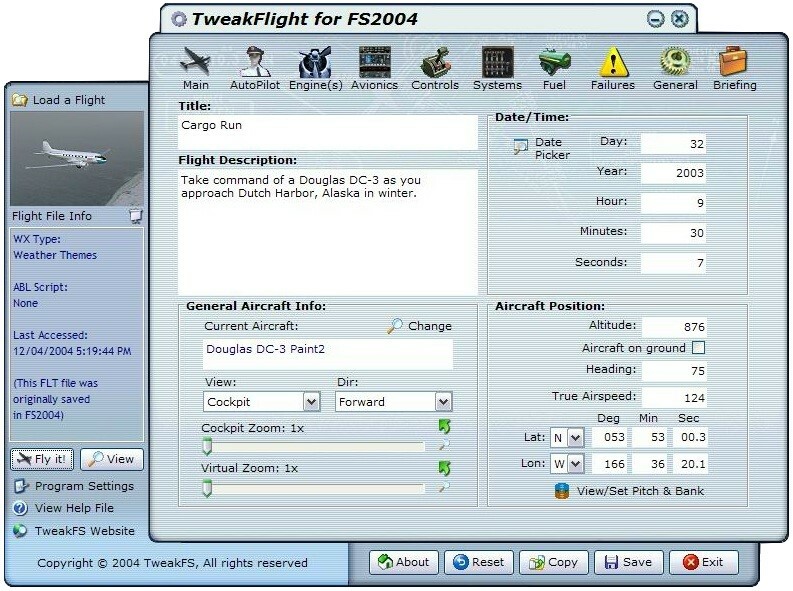 Simply select a FLT file from the displayed list after editing and saving your preferences, or select a previously edited FLT file and press the Fly it! button. 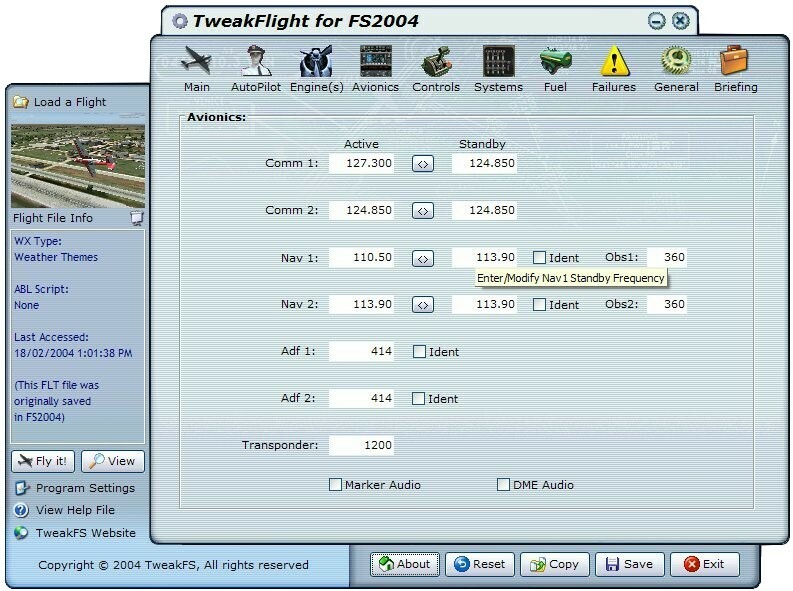 FS2004 will be launched (or activated if already running behind or minimised) with your selected FLT file. 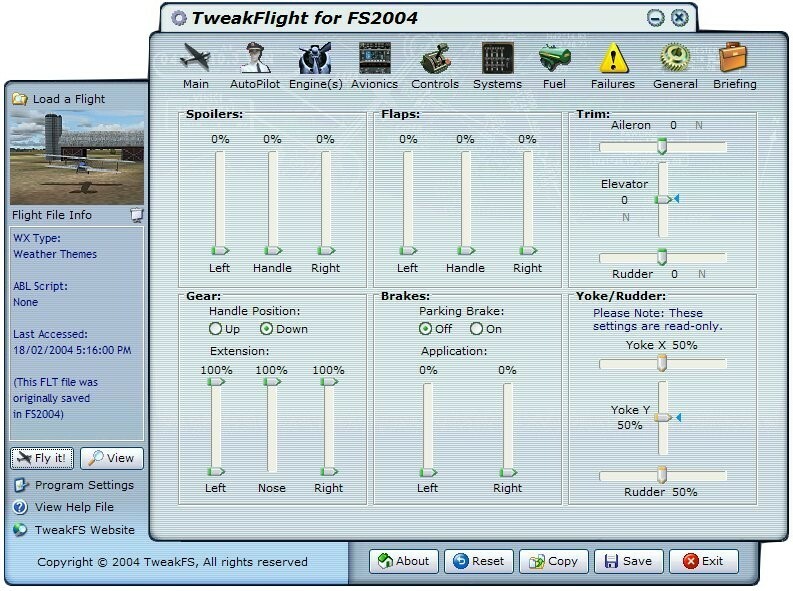 FS2004 introduced the pre-flight briefing in HTM (webpage) format and many of the installed FS2004 flights have an accompanying HTM brief which is also displayed on the kneeboard. 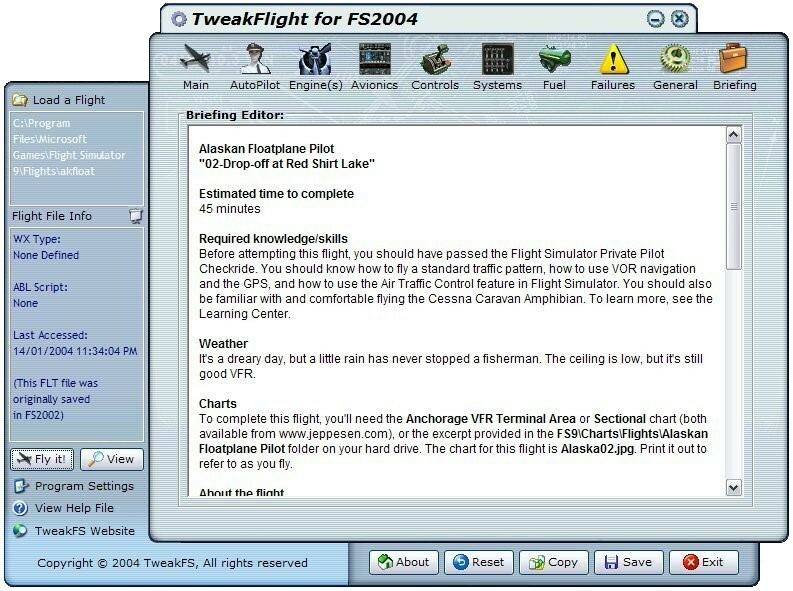 The HTM file has a matching filename to the FLT file and with TweakFlight you can not only view that document but also create one for those user-saved flights that do not have a briefing.